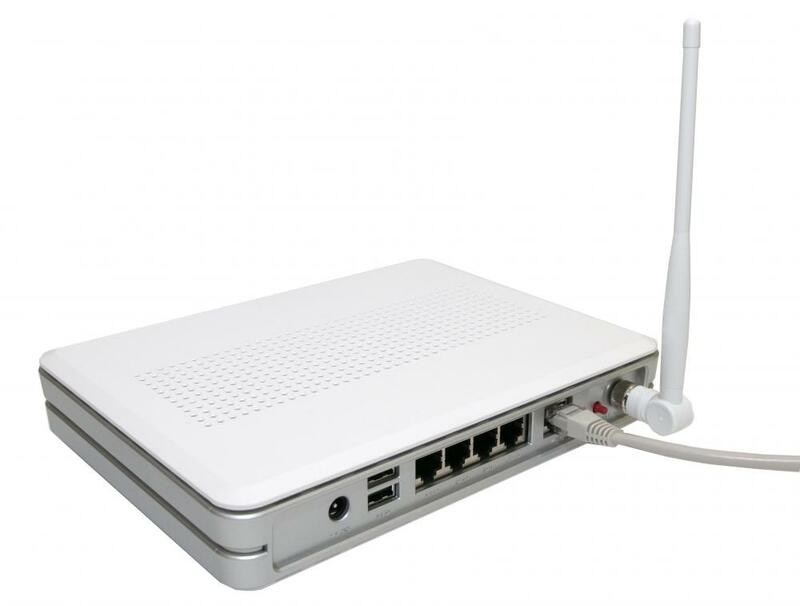 A wired router can be used to set up a home broadband network. A wireless broadband network router. A broadband home network is a way of accessing the Internet at high speeds on multiple computers and other devices. It can also be used to share files between different computers. Another use is to make it possible to print from multiple computers on one printer. The key to a broadband home network is the router. This is the device which physically connects to the phone socket and through which all Internet traffic to and from the home passes. The various computers in the home then connect to the router. This means that they can each connect to the Internet as well as to each other. The router will usually be permanently connected to the Internet, meaning there is no log-in process needed to get online on any computer. The filesharing aspect of a broadband home network can be very convenient. For example, it means that laptops or older computers with limited storage space can access files stored on a machine with more capacity. It also means video and audio content can be downloaded onto a computer and then displayed on a television through a device which connects to the network. This process is known as media streaming. It isn’t just computers which can be used on a broadband home network. Most modern video games consoles can also connect to the network and thus access the Internet. This connection means they can be used for playing games online against other players around the world. It also means they can download content such as demo versions of new games. Games consoles can also be used for media streaming. A broadband home network can also be used to share a printer among multiple computers. This saves both space and money. The most common method is to have the printer plugged into one computer and then have other computers send instructions to it through that computer, via the router. The drawback of this is that it only works when the computer plugged into the printer is switched on. An alternative method is to use a printer which can be plugged directly into the router, meaning any computer can use it even if other machines are switched off. Most routers offer wireless as well as wired connections. This means it is easy to use a laptop on the network without having to worry about plugging it in and then unplugging it when you use the laptop elsewhere. In some cases people will use a wireless connection even on a desktop machine. This can be useful in larger houses where running cables between the router and the computer is impractical. A broadband home network brings with it security issues. In most cases the router will include a firewall which blocks many risks. However, it’s still a good idea to employ both a firewall and security software on all computers connected to a network. A wireless network brings increased risks as it can theoretically be accessed by neighbors or passers-by without physical access to your property. For this reason it is important to use the strongest possible encryption on the wireless connections. What is a Home Computer Network? How do I Conduct a Broadband Speed Test? What Should I Consider When Buying a Broadband Router? What is Pay As You Go Broadband?